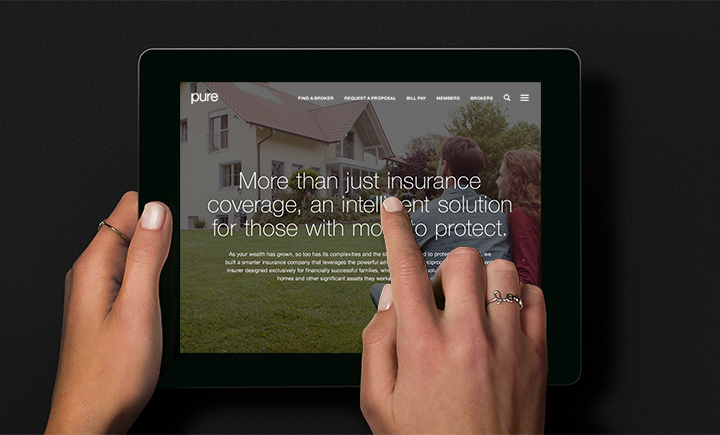 Redesigning the digital presence of PURE insurance to drive more qualified leads. How do you highlight PURE’s unique offerings and differentiate them in a landscape largely dominated by their competitor? Speak more directly: We highlighted how Pure does things better with a site designed for clear and concise communication. Reduce clutter: We streamlined the site across devices, leaving the legal and more complex company offerings to supplementary materials to keep the site clean and easy to navigate by both an older demographic and potential younger consumers. 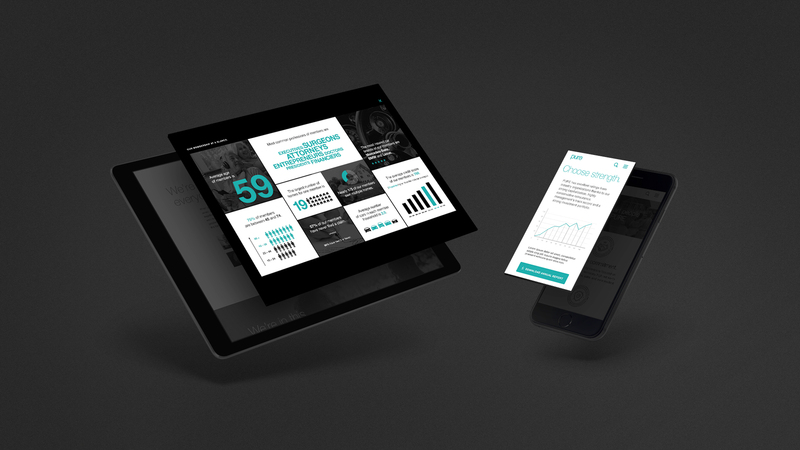 Speak more visually: Facts are better visualized than buried in paragraphs, so we designed the site to feature more infographics and video. Future proof with dynamic content: We set up the site to be highly dynamic with an easy-to-use interface that lends itself to future phases of strong brand content and potential changes to the PURE product offering. Everyone needs insurance—the problem is, the industry is incredibly competitive and everyone is selling the same schtick. PURE, an insurance company catered toward high-net worth individuals and families, had a compelling proposition, but it needed to be articulated in a way that better connected with their different targets to stand out from the competition. 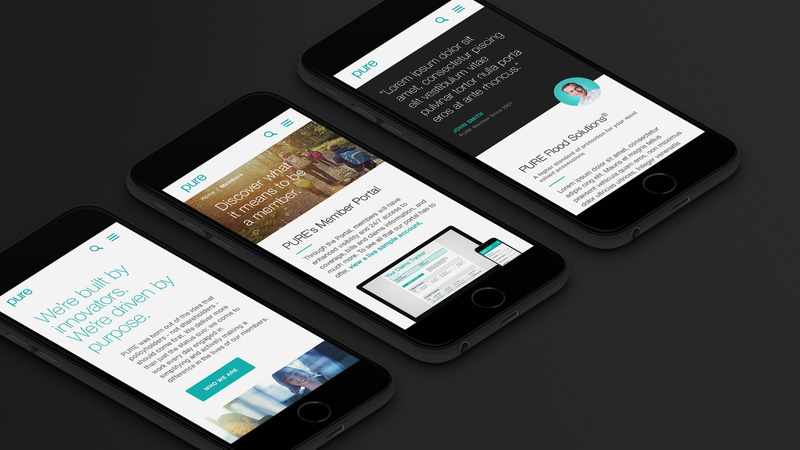 PURE tapped Firstborn to capture their brand voice in a simplified website redesign with updated brand positioning that makes it easy for users to grasp the company’s unique attributes. 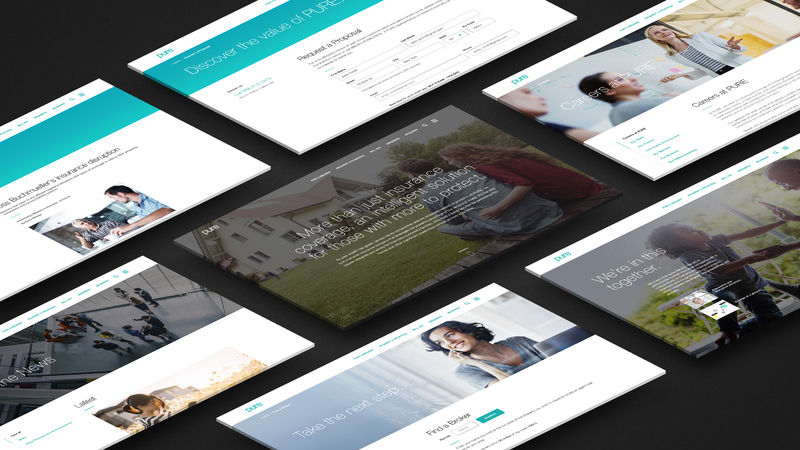 We created a digital platform that communicates the benefits of PURE to three distinct audiences—members, prospects and independent brokers—and optimized the site to drive more qualified leads. For current members, we reinforced how PURE offers more comprehensive service and coverage than their competitors at a better price. For prospects and brokers, we upsold PURE’s benefits while reinforcing the company’s financial stability in a strong, undeniable way that rebuts the most common rationale for choosing competitors over PURE. We then simplified the overall navigation and framework of the site by radically reducing the number of pages from over 60 main site pages down to less than 20. Consumers want to buy insurance, not waste time, so the updated UX makes it easier for each audience to find the information they need quickly to drive them further down the purchase funnel. We also integrated more lead generation tools and secondary calls to actions to drive name capture and conversion on each page by encouraging users to learn more by downloading PDFs, finding a broker or contacting PURE. 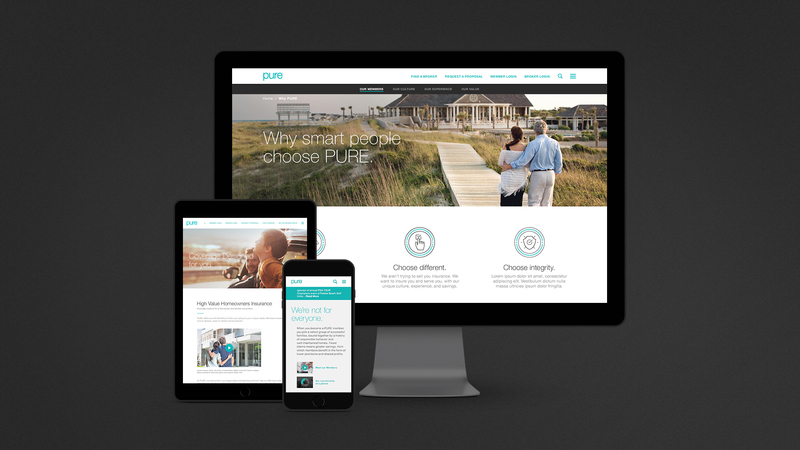 PURE’s brand voice is based on transparency and thoughtfulness, so we used clear, concise copy and visuals that better contextualize the benefits of PURE’s offerings. The design is flexible and intuitive, yet visually dynamic, with modules that can accommodate different combinations of text, case studies and sell sheets that validate their offerings and credibility in the space. Firstborn partnered with PURE to build a more powerful expression of their brand online. We delivered a new user experience that lets each audience find the information they need easily, while integrating more lead generation tools for name capture and conversion.